ALBERG, CARL. (1900-1986). 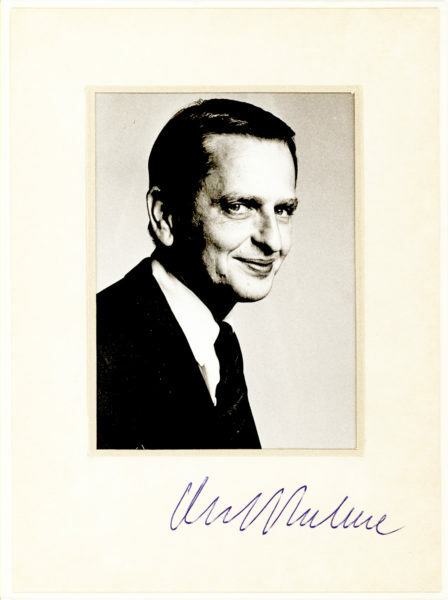 Swedish-born, American boat designer and pioneer of fiberglass yacht design. 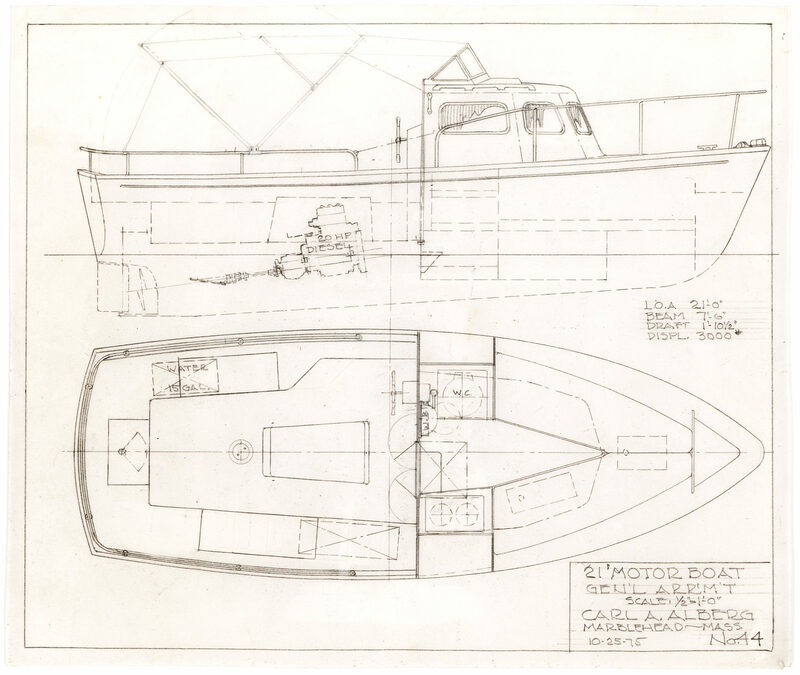 Detailed deck plan and side elevation for a 21’ motor boat, drawn in pencil and signed (“Carl A. Alberg”). 1p. Small folio (approximately 11¼” by 10”). Marblehead, October 25, 1975. Hover over image to magnify. Click to zoom. The LOA (length overall) is 21’ 0”, beam is 7’ 6”, draft is 1’ 10 ½”; displacement is 3000 pounds, and the drawings’ scale is ½” = 1’. Alberg has identified this sheet of drawings as project #44. The boat calls for a 20 HP diesel engine. After settling in the U.S. at 25, Alberg worked his way up from rigger to designer, opening his own office in 1946. In 1959, he designed the immensely successful Triton for Pearson Yachts, the first fiberglass auxiliary and still a popular yacht design. “Carl Alberg succeeded in bringing forth many of the first production fiberglass cruising sailboats from the design board to the dockside… His work from the late 1950s through his on-going work at the time of his death in 1986 was for a whole new market, the middle income sailor who may have been new to sailing or upgrading from smaller boats, many daysailors or racers,” (“Carl Arne Alberg – Pioneer in Classic Plastic,” Good Old Boat Magazine, Wallace). Alberg’s many successful designs include the Cape Dory 22, the Typhoon Daysailor, the Corinthian Conquest, and the Pearson Ensign and Ariel. In very fine condition. Alberg’s original boat designs are rare as most are held institutionally. At Lion Heart Autographs, every autograph we sell is unconditionally guaranteed authentic without time limit to the original purchaser.